Starch, and meat, and fat! Oh My! The deep freeze finally broke. Only a couple of days of melting weather and I almost forgot the inspiration for last week’s food. In the endless cold, I needed comfort. I craved starch. I wanted to be smothered in fat and cream. The internal furnace was stoked with meat. 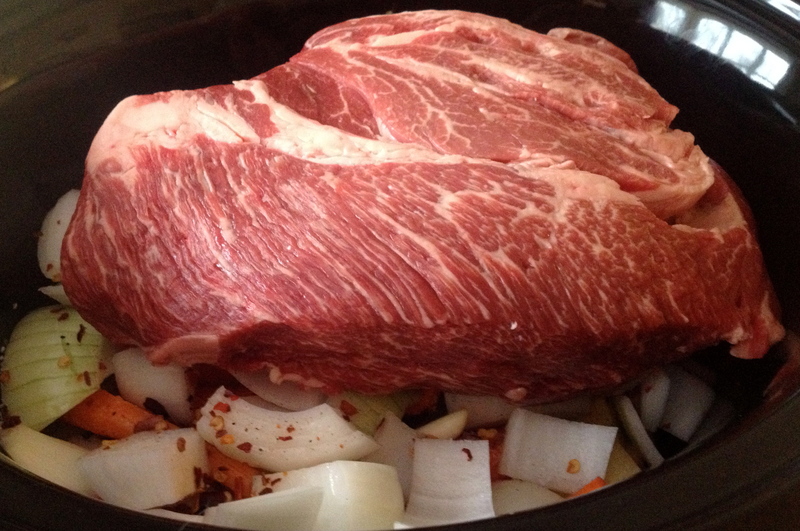 First was the uber easy Beef Pot Roast. A bunch of quartered yellow potatoes, and some carrots. One onion cut in large chunks. A large number of garlic cloves. As much black pepper as I could withstand grinding, and a liberal sprinkle of salt. Lay over that a hefty slab of “Bread and Butter Roast” beef. I put more salt and pepper, and a mug of red wine, and a layer of mustard as an afterthought. Then just let the slow cooker do it’s thing for about 6 hours. 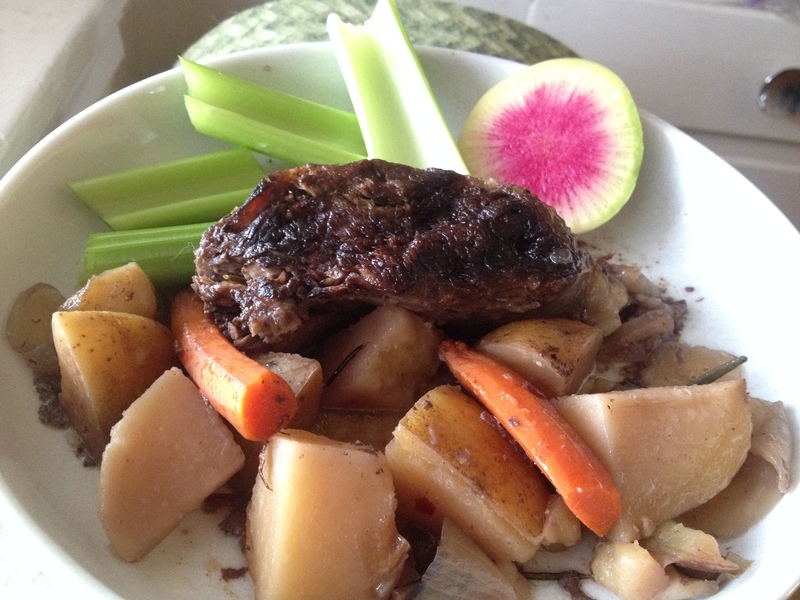 With some celery and watermelon radish to brighten up the earthiness of the roast. First I started the potatoes boiling for making mashed potatoes. I fried diced onions in 4T butter and a crap load of black pepper. + crushed garlic and a quite a bit of Spike seasoning. + 4T flour to make a roux. + 4 cups milk. Bring to a light boil and then back down to low. + parsley, dried this time, but usually fresh. + One whole head of savoy cabbage. Cabbage in cream, ham cubes waiting in background. While the cabbage was getting tender. Will mashed the potatoes and I diced ham. 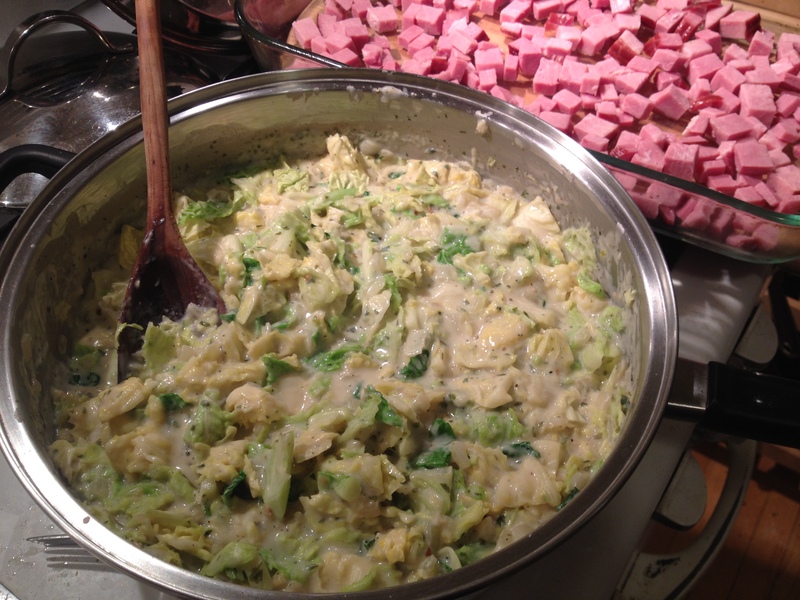 Poured the creamy cabbage sauce over the ham cubes. Dolloped the mashed potatoes over the cream. Then spread it smooth. Sprinkled it with some cheese. Put it under the broiler for about 5 min and then in the oven for 10. I think this could be done with so many other twists. I’m imagining something done with coconut milk. Someone please make a vegan version of this and share it with me! Later Will made Roast Chicken with potatoes and green beans. Warmer weather is a relief. I’m looking forward to spring food as much as sandals. What spring foods do you look forward to? 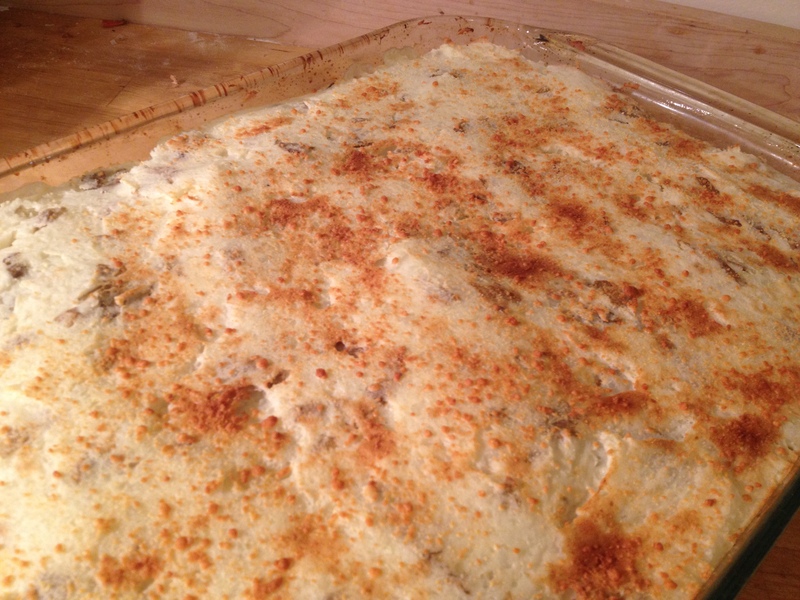 This entry was posted in Kym Cooked and tagged chicken, comfort food, cooking, creamy cabbage, food, pot roast, potatoes. Bookmark the permalink.